Larson Electronics, a leader in industrial lighting and equipment, has released a new hazardous location fan for active heating in hazardous locations and cold-temperature work sites. This 3,000-watt heating fan is compatible with 208V single phase operation, and has an airflow rate of 580 CFM. This forced fan heater is perfect for hazardous location use. It is class rated and features guard shields, pressure relief valves, and protection against freeze damage, giving users a very reliable and effective heater. Larson Electronics, a leader in industrial lighting and equipment, has released a new hazardous location fan for active heating in hazardous locations and cold-temperature work sites. This 3,000-watt heating fan is compatible with 208V single phase operation, and has an airflow rate of 580 CFM. This Class I Division 1 & 2 and Class II Division 1 & 2 fan heater is ideal for heating, manufacturing plants, chemical processing, cold-temperature facilities and other hazardous locations. 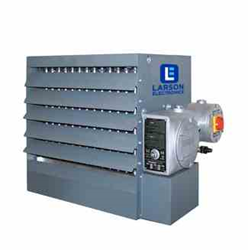 The Larson Electronics HAH-FH-WM-T3B-3KW-208V.1P hazardous location fan from Larson Electronics is a 3,000-watt forced fan heater operates on 208V single phase with 24V control voltage, providing operators in hazardous locations and cold-temperature work environments with safe and reliable active heating. This heating fan has a 580 CFM airflow rate that produces a 24-foot air throw for wide flow circulation. This Class I, Divisions 1 & 2 and Class II, Divisions 1 & 2 heater is a 16.3-amp rated unit with a T3A temperature rating. The HAH-FH-WM-T3B-3KW-208V.1P has a variety of features that make it ideal and safe for hazardous locations including guard shields to protect the internal, moving parts. This hazardous location fan forced heater is constructed of 14-gauge steel and aluminum with stainless steel/aluminum pressure relief valves for high durability. This unit also includes versatile louvers that allow operators to control the direction of air leaving the fan in real-time. For protection from freeze damage (up to -45° C), the unit utilizes a Ethylene Glycol to water mixture as a heat transfer fluid inside the heater core, and is rated for 6,000 cycles of service. This forced fan heater can be mounted on walls or other sturdy structures with a bracket.